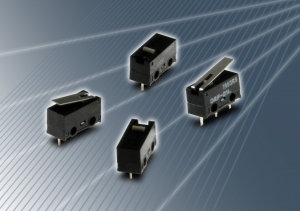 A new ultra-miniature micro-switch from Omron Electronic Components BV features a mechanism to enhance switching reliability as well as a two-stage bottom housing with different levels designed to prevent flux penetration during manufacturing. The Omron D2F micro-switch is just 6.5mm (h) x 12.8mm (w) x 5.8mm (d) and incorporates insertion moulded terminals and a snapping mechanism. This is constructed with two highly precise split springs to ensure a long and reliable service life. The D2F micro-switch has an operating voltage of 125VAC at 3A and 30VDC at 2A, an insulation resistance of 100M Ohm and an operating temperature range of -25°C to 85°C. The D2F supports a wide variety of terminal types and configurations including self-clinching PCB, right-angled, left-angled, and solder terminals. For high volume applications the operating lever, wire cable, terminals and housing can be customised to meet specific customer requirements. The D2F product family is RoHS compliant.